The Brunswick Blitz Double Roller is a basic double roller with a 5-year manufacturer's limited warranty. This bag was designed to carry 2 bowling balls, shoes up to a men's size 17 as well as accessories. Stop toting and start rolling with the Brunswick Blitz Double Roller! Hi Travis! This product is in stock. How many side pockets: 1 or 2? Hello Ann. There is only one large accessory pocket located on the front of the bag. Love the appearance . What kind of material is it made of and what does the warranty cover ? Hi! This roller will have a 600 Denier fabric. The warranty will cover any defect or damage to the bag. Yes, it will have two cups to hold the bowling balls on the inside. Can this bag fit 2 pair of shoes. My wife and I bowl together and have one ball each. I'm sure it could store another pair of shoes in one of the accessory pockets. This bag will either have dividers to separate the balls or they will have straps to secure the bowling balls. The larger wheels would probably not fit on this particular roller. 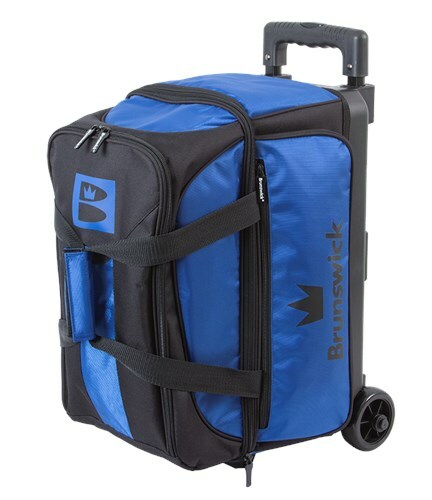 Due to the time it takes to produce the Brunswick Blitz Double Roller Blue ball it will ship in immediately. We cannot ship this ball outside the United States.